Spring is the peak harvest time for artichokes, and this time of year is also the kick-off of the traditional grilling season. I'm almost embarrassed to say that, although I love artichokes, I've never grilled them. I finally struck them from my to-try list last weekend. 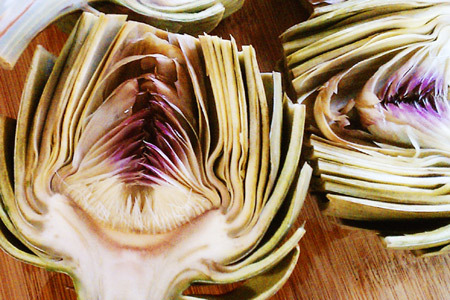 Being flower buds, artichokes require some unique preparation, but it's really not difficult. Once you get the hang of it you can make pretty quick work of them. Like many things, the first one is a learning experience. I served these with a nice tangy garlic and chive aioli, which complimented the fire-roasted buds nicely. 1 Tbsp Chives, chopped to 1/8"
Combine all of the aioli ingredients in a small mixing bowl, whisk well, cover and refrigerate at least one hour to allow the flavors to marry. Add about a gallon of cold water to a stock pot and stir in the lemon juice. Rinse the artichokes well under cold water, then shake off the excess water. Trim about 1/2" from the stem, and 1 1/2" from the top of one artichoke. Using kitchen shears or scissors, trim about 1/2" from the tip of each petal. 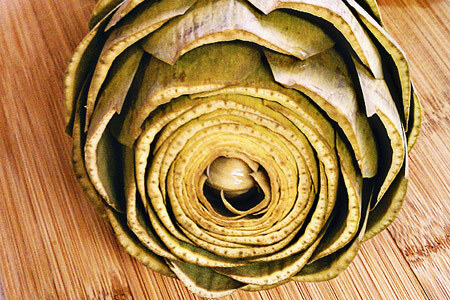 Slice the artichoke in half vertically. Using a melon baller or a spoon, scoop out the choke (the hairy looking thing and the purple leaves) from each half of the artichoke. Put the artichoke in the lemon water. This prevents the cut portions from turning brown. Repeat the process with the remaining artichokes. About 45 minutes before you're ready to serve, remove the artichokes from the stock pot, drain the water, add about an inch of fresh water and a steamer basket to the pot. Steam the artichokes for 20 minutes. 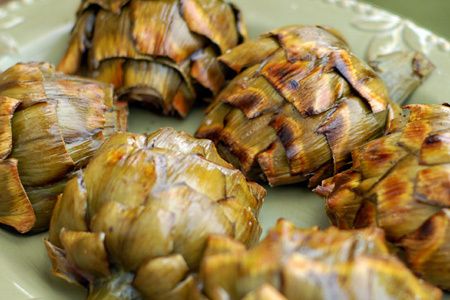 While the artichokes are steaming, start your grill and prepare for indirect cooking at medium-high heat (350-375º). Remove the artichokes to a sheet pan and season each half liberally with salt and pepper. Spray both sides of each half with oil. 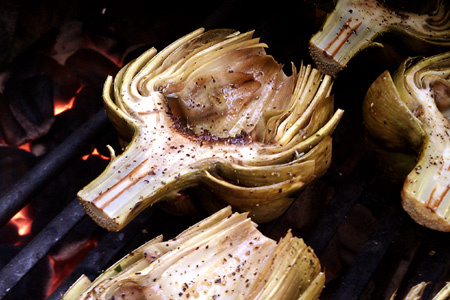 Grill the artichokes cut-side-up indirect for 15 minutes. Turn the artichokes over and grill indirect for another 10 minutes. Serve with the aioli and enjoy! could you broil them if you didn't have a grill? Can you eat the leaves of the artichoke as well? Now how do you go about buying artichokes, do you have a technique for finding good ones? Here's some advice on selecting good artichokes. Sounds delish! Will definitely be trying. Thanks! Wow, that recipe is delectable! I've been looking for a new and unique dish to bring to my uncle's Memorial Day cookout, and I believe I've just found it. :) (Though I think I'll try out a couple tomorrow for my boyfriend.) Thanks for sharing! Artichokes are delicious. They are definitely a weird thing to prepare the first time around though and take some getting use to.